Lone Star Family Farm was founded in 2013 but the story goes back a little further than that. In 2009, Josh and Ashley Ritchey, began growing and selling watermelons and cantaloupes to grocery stores in the Lubbock, Texas area. They grew their produce on the only land that was available for leasing at the time - development lots that were for sale inside the city limits of Lubbock. After a couple of years of growing watermelons and cantaloupes and facing various challenges, the Ritcheys began exploring ways to cut down on harvest labor. In 2011, the Ritcheys found their new niche. They grew their first you-pick pumpkin patch in the middle of Lubbock. 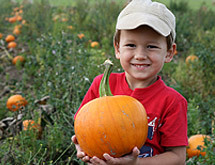 Visitors enjoyed picking the perfect pumpkins right from the field - a new fall tradition for families in the area. The patch was a great success and so the decision was made to do it again the following year. The Ritcheys had two great pumpkin patch seasons in Lubbock then received notice their pumpkin patch land was going to be sold to a big box retailer. After weighing various options, the family decided to make to move to Stephenville, Texas where they had recently leased some farm land. Stephenville offered the Ritcheys the opportunity to continue their new fall tradition. With a "Young Farmer" loan from the USDA Farm Service Agency, Lone Star Family Farm was purchased in the summer of 2013. 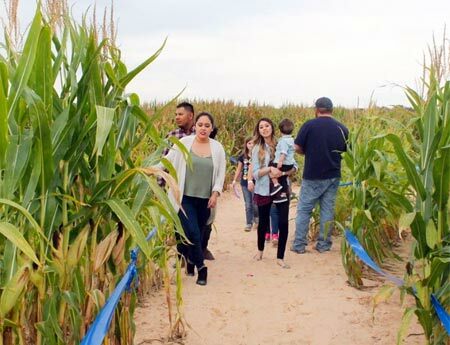 The following October, the new pumpkin patch opened - offering pick-your-own pumpkins, hayrides, photo opportunities, and other fun attractions for groups and families. Our inaugural year was a success and Lone Star Family Farm continues to grow. In 2014, we added a 6-acre corn maze for visitors to explore as well as other fun activities. We continue to add new attractions each year as we work to make our farm the "FUNNEST place in Texas to get your pumpkins!" We look forward to another year of fall fun with you and your family or friends!